After the splendid work they did on bringing high definition transfers of The Prisoner and the first series of Space:1999 to Blu-ray, Network now turn their attention to the rest of the ITC back catalogue in 2011. 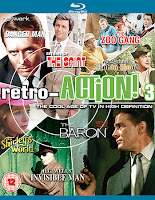 In February, they release three volumes, as web exclusives, of Retro-Action! 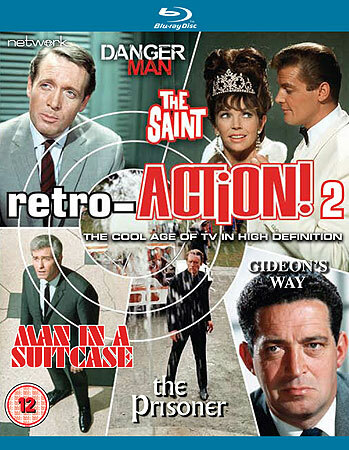 as a taster for the full box sets to come of some of the best known and well loved adventure series made for British television in the 1960s and 1970s. I've been lucky enough to look through the contents of the first volume that contains episodes from The Champions (1968-69), Department S (1969-70), Randall and Hopkirk (Deceased) (1969-70), Strange Report (1969-70) and The Persuaders! (1971). 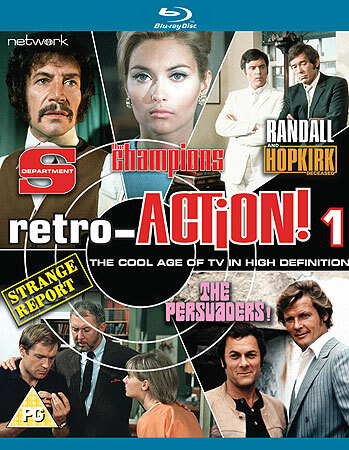 As you can see from the line-up on this first volume there is a focus on the major producing partnership between Monty Berman and writer Dennis Spooner whose company Scoton Productions, formed in 1967, created The Champions, Department S and Randall and Hopkirk (Deceased) for Lew Grade's ITC. While, as James Chapman notes in his study of the British spy-fi adventure genre Saints and Avengers, many of these programmes met with much critical opprobrium at the time of their transmission, their appeal to audiences of the time seems to have survived by dint of nostalgia. Scoton's output is still highly regarded by telefantasy fans even though most of these programmes lasted barely one season. In the end they remain a testament to Berman and particularly to Spooner whose writing career spanned everything from Gerry Anderson's Thunderbirds and Stingray, to Doctor Who and The Avengers as well as the creation of many enduring ITC adventure series. I'm not going to review each series here as that's something I'd rather do when each Blu-ray box set is eventually released. What I will do is briefly highlight the episodes that represent each of the series on this disc and the quality you can expect from these new high definition transfers. Judging by the first sample, high definition invests these classic series with a new life. The Champions, on this evidence, benefits from greater detail, impressive colour and contrast especially in the location work where trees, foliage and water are alive with detail and colour. There are some instances of sparkles on the picture but they are certainly not a distraction. 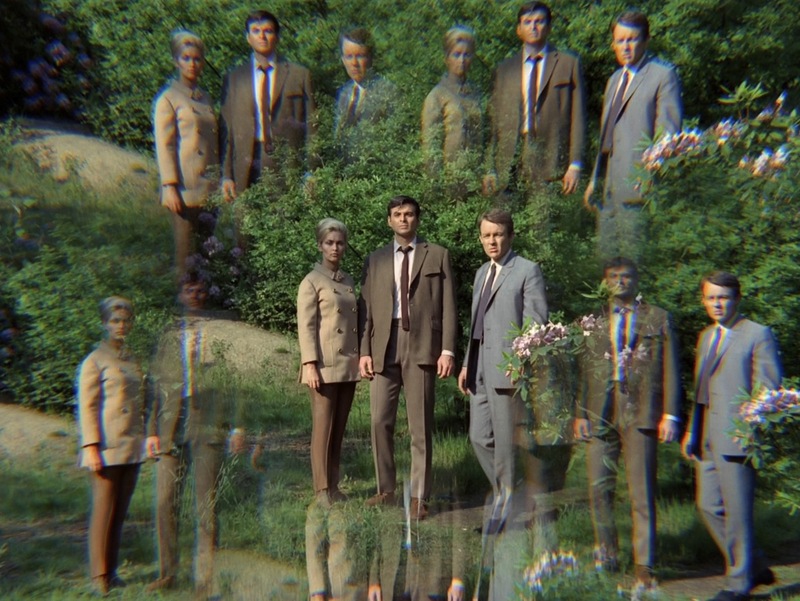 The Champions was the original British superhero series featuring three secret agents, Craig Stirling, Sharron Macready and Richard Barrett, augmented by Tibetan mystics who provided them with telepathy, precognition, super hearing and strength. Its themes tap into the vogue for joining the so called 'hippy trail'. The Champions premise also, as James Chapman notes, harks back to films like Lost Horizon where ancient and advanced civilisations can bequeath 'enlightenment' upon the weaker Western man. As I outlined in my own view of late 1960s Doctor Who story The Abominable Snowmen which was also set in Tibet and featured Eastern mysticism and science, it was a time "when many Westerners, particularly young people, were turning to the East for wisdom, and when travel to India and Nepal was for the first time relatively easy and inexpensive for people in Europe and the USA". The series thus ends up extolling a sense of the virtues of this philosophy over more rigid, anti-Western political forms prevalent in China and South America. The three then end up working for a United Nations agency called Nemesis and spend 30 episodes wrecking the schemes of various villains and non-democratic, often third world, regimes (Chinese and South Americans are again the usual suspects here). There is the constant threat that their boss, Tremayne, will discover how these three agents always manage to achieve the impossible despite the odds. However, the episode on this disc, Donald James The Invisible Man, is atypical in that it involves the three agents foiling a $30 million gold bullion smuggling operation rather than clashing with upstart Communists and their machinations. 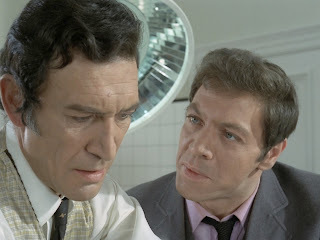 Surgeon John Hallam, and played by Peter Wyngarde in the first of two appearances on this volume, has devised a way to manipulate a leading banker, using torture via an implanted device, into allowing the theft to go undetected. Look out for Basil Dignam as the banker Sir Frederick Howard, a great British character actor who always seemed to play policemen, bankers, peers and company executives in a wide range of British drama, and for eccentric character actor Aubrey Morris as Van Velden, Hallam's Dutch port authority connection. The episode also features an amusing pre-titles sequence that includes Dave Prowse as a weightlifter befuddled by Craig and Richard's antics in the gym. An entertaining episode with the relationship between Hallam and his associate Sumner intriguingly suggestive of a very special partnership, if you get my drift. Here medical science is part of the threat, acknowledging the pessimism about advances in technology that were prevalent in the late 1960s, and it is supernature that it eventually succumbs to. It's typical of many ITC shows made on a tight budget where recycling of sets and copious amounts of stock footage were employed to create that necessary international ambience for overseas sales. 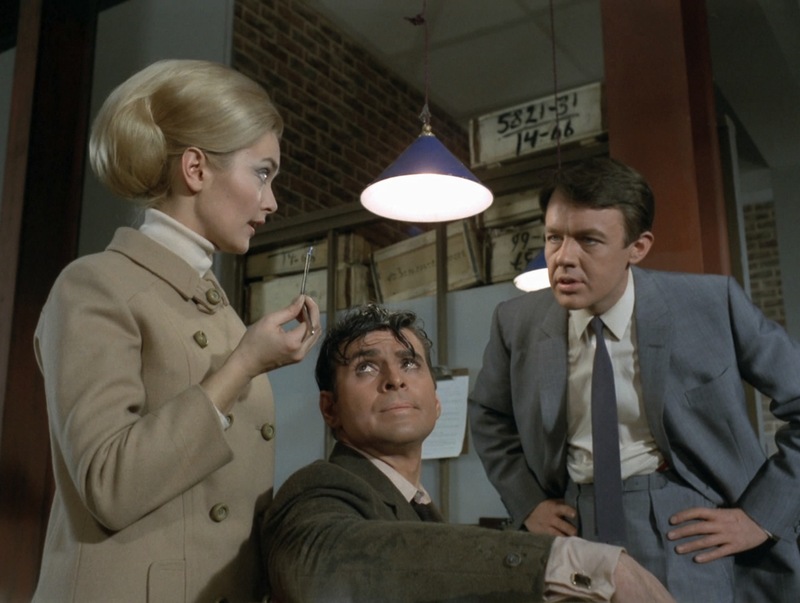 However, despite the small budgets The Champions, like many of its stablemates, is a colourful, glossy adventure series and the three leads, played by Stuart Damon, William Gaunt and Alexandra Bastedo, worked very well together even if their characters fantastical qualities were framed within plots that had more to do with international politics, the Cold War and rogue science. Compared to many of the ITC spy-fi shows Randall and Hopkirk (Deceased) is something of an oddity. As James Chapman noted in Saints and Avengers, the series begins in a typically whimsical fashion but then seems to change direction further into the season and concentrates less on the supernatural elements and is more focused on seedy crime plots. This goes hand in hand with the show's very domestic setting where, unlike many of the other ITC series in which the protagonists spend a fair bit of their time jetting around the world (mainly through the use of the aforementioned stock footage), Jeff Randall and Marty Hopkirk (the dead one) are more or less left snooping around the grubbier back streets of London. The only exception was the studio recreation of Monte Carlo for the highly amusing The Ghost Who Saved the Bank at Monte Carlo. On this disc we have a typical piece of Tony Williamson whimsy, When Did You Start to Stop Seeing Things? which sees an impostor taking Jeff's identity (wearing a latex mask) to help a company manager, Laker (the ubiquitous Reginald Marsh) bump off his colleagues and do a fiddle on their stock market shares. Marty has to enlist the help of psychiatrist Sir Oliver Norenton's hypnotised patients to uncover the truth and find the real Jeff who is confined to a cellar in Laker's manor house. Norenton is played by Clifford Evans, best remembered at the time for The Power Game. 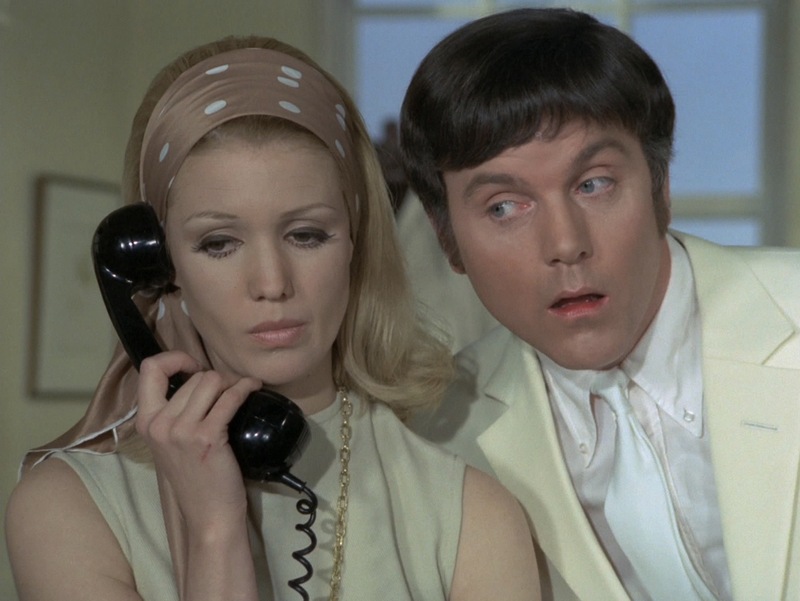 Kenneth Cope, as Marty, is on great form, running from outrage as the fake Jeff tries to get it on with his widow Jeannie to frustration as each attempt to find out why Jeff is behaving so irrationally fails miserably. Probably the best scene is when Norenton, hypnotised by Marty, becomes first a panther and then an all action spy through auto-suggestion and charges into Lake's house and proceeds to duff up all the villains. 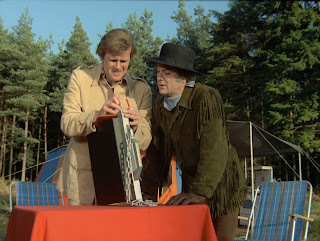 The high-definition transfer is vibrant and sharp but as with the transfers for The Champions and The Persuaders there are instances of dirt, showing up as very occasional white sparkles on the picture. Despite this the images are full of depth, exceptional colour fidelity and render the details on clothing, wall coverings and faces to perfection. A Small War of Nerves, written by Harry W Junkin, is a rather neat little episode in a series that reflects much of the fantastical element of the later episodes of The Avengers and repeats the two man - one woman team set up of The Champions, minus the superpowers, later revived for The Protectors and The New Avengers. 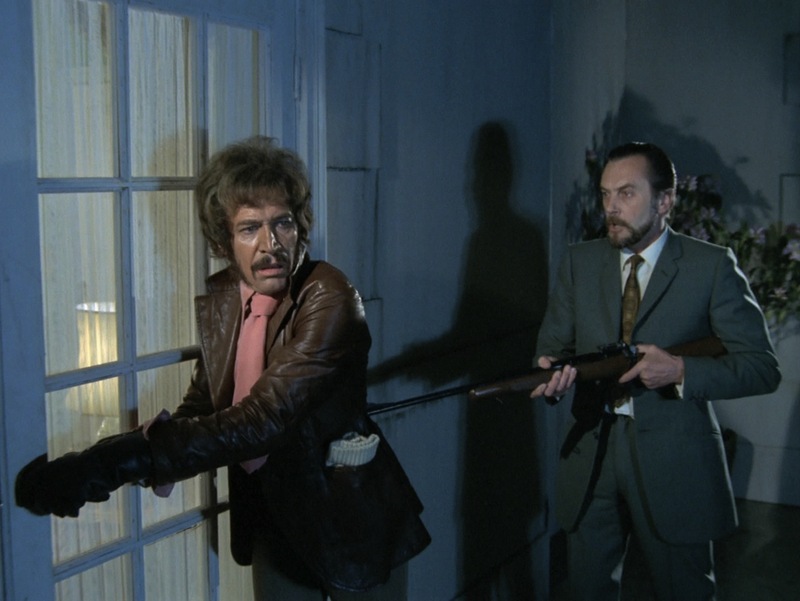 Department S is an enjoyable spy-fi series, partly dominated by Peter Wyngarde's eccentric dandy author Jason King. King is a camply excessive extension of the gentleman hero complete with an exuberant Carnaby Street inspired wardrobe, bouffant hair, a Zapata style moustache and a set of sideburns you could get lost in. 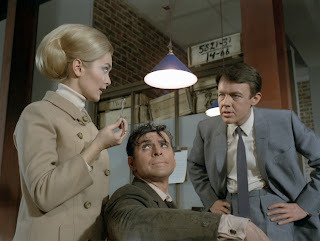 He's paired with Stewart Sullivan (Joel Fabiani), a rather anodyne, straight-laced investigator and a girl computer whizz, Annabelle Hurst (Rosemary Nicols) who tends to rattle around looking worried and carrying stacks of print outs or answering phones. 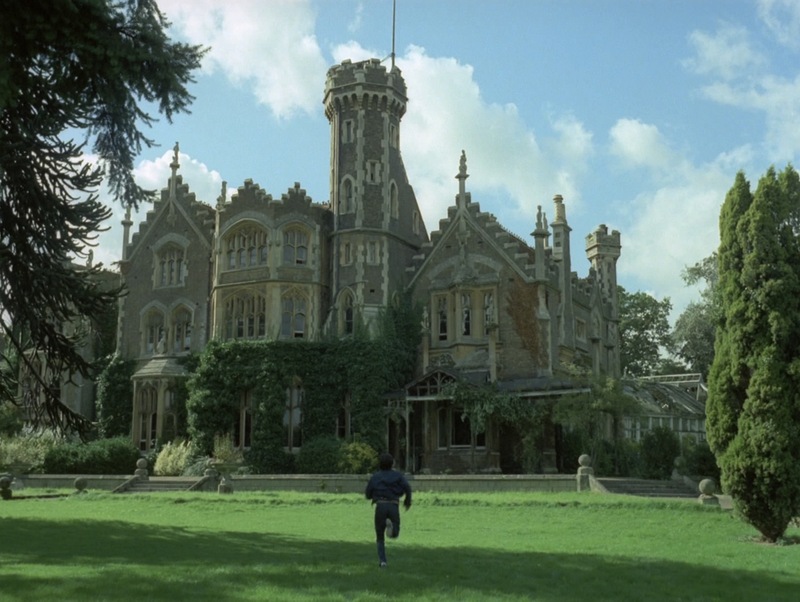 The series mixes the modernist notion of a world threatened by the bizarre and the inexplicable with the idea that novelist King is somehow recreating the world of his adventure hero Mark Cain to overturn the series own genre conventions and expectations. Here, the trio attempt to locate a missing chemist, Halliday, who has absconded from a government biochemical warfare research department with a phial of nerve gas, under strain after the full realisation has dawned upon him of the gas's ability to wipe out entire populations. 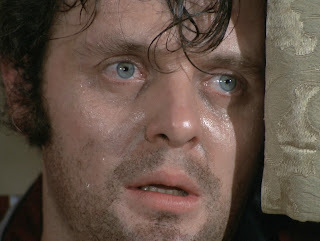 However, Halliday (a rather effective performance from Anthony Hopkins) is also the target of international terrorists who intend to sell the gas to the highest bidder. The episode explores the morals of scientific research (a clash of opinions in the opening of the story starts the ball rolling) and Halliday's belated sense of conscience in a still highly relevant storyline. Hopkins is excellent but the real highlight is Wyngarde. There is some unintentional humour as Stewart and King examine Halliday's abandoned room ("there should be some prints on those drawers" purrs Jason) and his bitchy comments about Annabelle's efforts to trace Halliday are priceless. 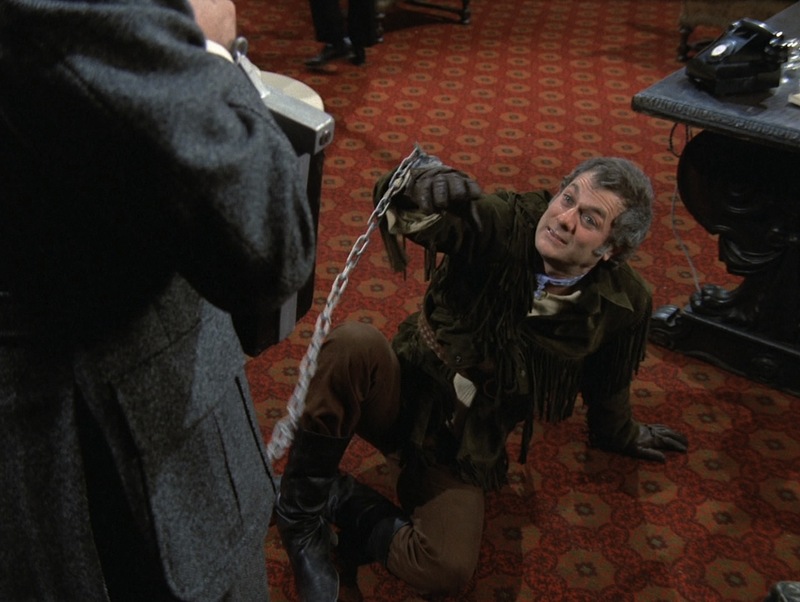 King's attempt to rescue Halliday from the health club where the villains are holding him is one of the funniest sequences in the episode with Wyngarde, in a fetching leather jacket and powder pink shirt and tie, mugging and camping it up something rotten. Both are joined by an exceptional guest cast including Colin Gordon and Frederick Jaeger. Again, these episodes were beautifully restored some time ago and featured on the DVD box set issued by Umbrella in 2006. However, the quality of the high definition image here surpasses these and is so good that Hopkins's check jacket, violently striped pyjamas and the sweat on his face are so vividly presented on screen you feel you could touch them. 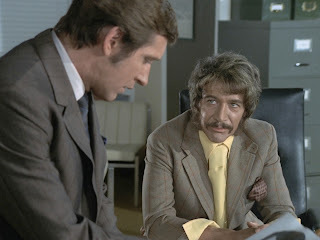 It also has the unfortunate effect of betraying just how much fake tan and eye make up Wyngarde is smothered in beneath the exploding hair, sideburns and moustache. The colour is again vibrant and the detail quite astonishing. By the time we get to Strange Report's Report 2493: Kidnap - Whose Pretty Girl Are You? written by Don Brinkley, ITC were co-producing with NBC's film unit Arena (responsible for among others Dr. Kildare and The Man From U.N.C.L.E.) and consequently US writers and producers had a major influence on the development of the series. I remember it playing in late night slots on Granada in the early 1970s and it's certainly one of the more obscure series produced by ITC. It has a passing resemblance to the later Quincy M.E. 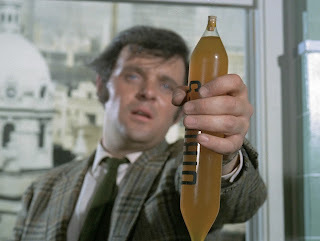 in that it was one of the first crime dramas to popularise the use of forensic science and criminal pathology in detective fiction. 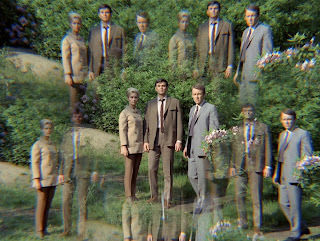 The mix of American producers and writers, British directors and actors means that Strange Report is something of a curious hybrid and is certainly more of a straightforward crime series, opting for a realistic reflection of the social and political concerns of the late 1960s, as opposed to the more whimsical or fantastical capers of the Monty Berman productions. 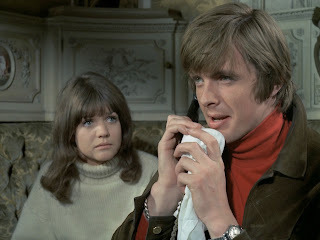 The three investigators, Adam Strange (respected British thesp Anthony Quayle), Hamlyn Gynt (gorgeous Kaz Garas) and Evelyn (the equally lovely Anneke Wills), are concerned with the kidnapping of Jennifer Dean (Bless This House's Sally Geeson) from a beauty contest and the ransom demands to her father Otis for her return. However, all is not what it seems and the kidnapping is an elaborate scam concocted by her and her boy friend Toby (played by a young Ian Ogilvy who probably shot this shortly after Witchfinder General) to extort money from her rich father. The story is full of the sort of generational conflicts and stresses that Strange Report would make its métier. 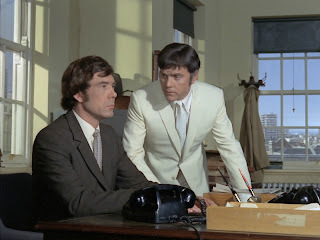 Joining Ogilvy and Geeson are a bevvy of British character actors including Peter Jones and Caroline Blakiston as the contest organisers, John Arnatt as Inspector Hughes and a young, rather cute Richard O'Sullivan as Perk, a reluctant member of the kidnap gang. The series was restored and cleaned up by BBC Resources in 2003 and I presume the high definition transfers originate from that restoration. If they do, then this example shows what a great job they did. The quality is exceptional with colour and detail lifted to an an even higher standard. Clothes, fabrics and furnishings sing with fine detail, the colour palette is rich and full of depth and the location work, shot mainly at Oakley Court in Bray (used for a number of Hammer films, Freddie Francis Mumsy, Nanny, Sonny and Girly (1969), The Rocky Horror Picture Show (1975) and various television series including The Secret Service and The New Avengers), is captured with ravishing quality. Flesh tones and features are wonderfully highlighted too. Finally, we come to perhaps the glossiest and most expensive of all the ITC adventure series The Persuaders! which saw the series eschew the use of stock footage to amplify any globetrotting credentials in favour of the production going on location in Europe. However despite its overt overtures to the glamour of male fantasy and its enduring success in the UK and Europe it failed to set the U.S. market alight. Clearly targeted at an international audience, the series was co-produced for ITC by Robert S. Baker, Johnny Goodman and star Roger Moore through their own Tribune Entertainment subsidiary. Both producers aimed for an American co-star to enable the series to crack the lucrative U.S. market and they eventually settled on Hollywood star Tony Curtis to provide the character of rough diamond Danny Wilde as the foil, in the series's double act, to the sophisticated Brett Sinclair played by Moore. The series is a mixture of private investigation caper and spy thriller and is driven by the relationship between Wilde and Sinclair whose shenanigans and cultural clashes dominate the narratives. Looking at it now, it reflects the penchant in the 1970s for male buddy relationships in films and television, perhaps echoing the success of films like Butch Cassidy and the Sundance Kid (1969) and the homosocial interplay between its stars Redford and Newman. As James Chapman notes this formula is set up "to present an ideal of male friendship based on mutual respect and camaraderie" and the episode here, Terry Nation's Chain of Events, is full of the bitchy, backbiting humour in "the form of friendly rivalry, light-hearted banter and constant oneupmanship" that the two characters were noted for. The abrasive relationship between the characters on screen is also said to have reflected the one that was mooted off-screen between the two actors. 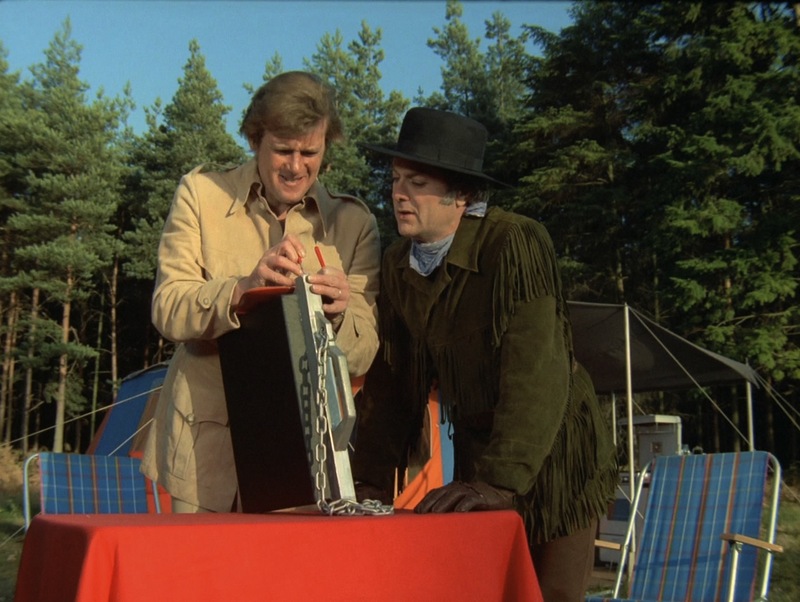 The opening scenes of the two men offering divergent interpretations of a camping holiday are typical and the plot also underlines the series's requirement to get Danny Wilde into scrapes from which Sinclair must extricate him. Wilde becomes embroiled in a struggle to recover an attache case, containing vital secrets that the Briitsh are anxious to recover, when a dying parachutist chains him to it. He is not only pursued by agents from both East and West but he also has to avoid being blown up by the booby trap in the case if it is opened without a key. Much comic mayhem ensues, of course. The episode is once again littered with British character actors and you'll have great fun watching the likes of George Baker, Peter Vaughan, Jeremy Child and Morris Perry in this story. The high definition transfer is again impeccable and the colour and detail here are particularly lush and vibrant. Again, clothes, furnishing, set design and faces are rendered with fine textures. Finally, it would be silly not to mention the music that these ITC productions are famed for. The majority of the shows the company produced boasted superb title themes - written by among others Edwin Astley, John Barry, Ron Grainer and Tony Hatch - and memorable incidental music provided by Albert Elms, Robert Farnon and Astley. Their music is an integral ingredient to the success of these productions and are the perfect accompaniment to these now splendid looking episodes. Man in a Suitcase: Somebody Loses, Somebody… Wins? Both released 28 February 2011 with Volume 1 as web exclusives through Network DVD. 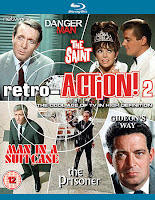 For more on these ITC classics why not pop over to Jaz Wiseman's The Morning After site.